I have become incredibly lazy on here and have a backlog of 8 beers. 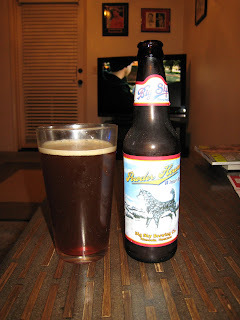 The first one is the Big Sky Powder Hound, another Christmas in July beer here. The color is a nice reddish brown, and there is very little head, a common trait of these winter brews. There is absolutely no smell to be found here, and the taste is incredibly light and nutty. It is a simple winter beer, and I would like to taste this when it is fresher. The website says there is "an avalanche of hops that will make you want to say these three words- "I'll have another Powder Hound!" I guess 1 for 2 isn't bad.